You may have not thought of it, but wining and dining is one part of weddings that have been there since time immemorial. For many, getting the right professional to do your “food” on the day you say your “I do’s” may come as a challenge. Here are 5 steps to land you the right wedding caterer without losing a shirt or two. 1. Settle your budget first. You and your life-partner-to-be need to come up with a specific amount dedicated solely for the wining and dining. Take time to answer questions on what particular eating experience you would like your guests to have (e.g., buffet, plated meal). 2. Widen your options. 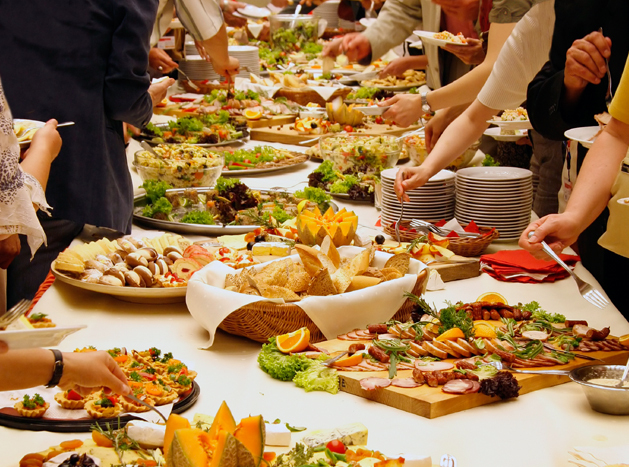 Go to different wedding shows of food exhibits to get to know various caterers. Do not forget to take their business cards for easy access. Also talk to your other vendors or BFF’s(e.g., florists) as they may have somebody in mind too. 3. Narrow down the list. Get 5 or 6 options and weed out the rest as more can make you ineffective. Prepare some pertinent questions and call each one to get to know more details. 4. The proof of the pudding is in the eating. Get to narrow down to your final 3 best candidates by requesting a sampling of the menu items. Do not make the mistake of ruling out this part as this is the dealmaker or dealbreaker. It’s plain simple: You pay the wrong caterer and spill thousands for unwelcome food or taste their wares. 5. Decide. Now that everything has been laid on the table, taking your best pick would be easy. Just make sure you read the fine print of the contract as hidden charges may stay hidden until it’s time to pay.